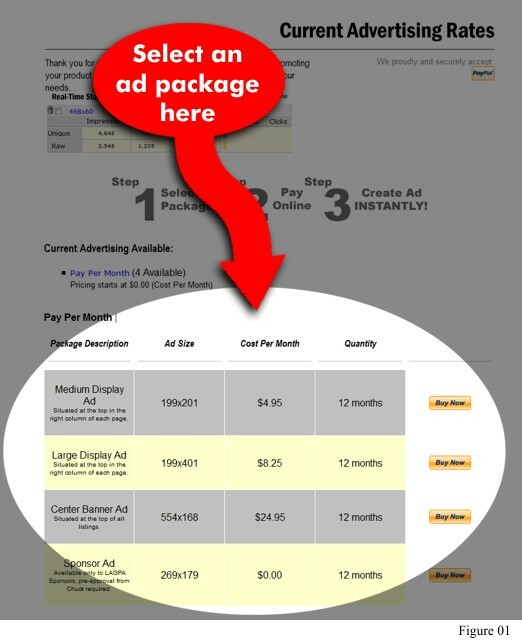 On the next page, select the ad package that suits your needs (please refer to the graphic below, which clarifies where on the next page you'll find the section to select an ad package). Use the Buy Now button to the right of your choice to make your online payment with PayPal. Once payment is made you'll be automatically linked to your advertising account page. On the advertising account page you may either create an instant, text-only ad (use the "Rich-Media Ad" field) or upload your pre-designed image with the exact pixel size noted. We can create your image for you (discounted from $150 to $39.95) once you place your order. Call 805--898--9267.